Melt 3 tablespoons of butter on low heat in a small skillet - the size of your sandwich. If doing 2, then use a large skillet and add 5 tablespoons of butter. Once the butter is melted place a slice of bread in the skillet, press it slightly and let it soak up the butter for a few seconds. Remove it and place it buttered-side up on a plate. Now place the next slice of bread in the pan and move it around until all of the remaining butter is soaked up into the bread. 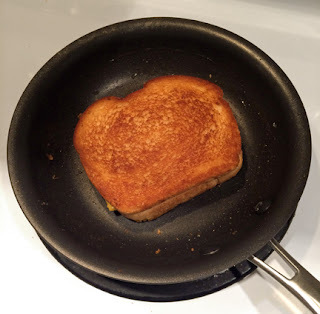 Now put your cheese on the bread in the skillet and top with other slice of buttered bread. You will end up with an evenly golden browned and very crispy sandwich. I like to use both American and Swiss cheese. Of course you can use any cheese or combination that floats your boat. Sometimes I make a hot ham and cheese by adding a layer of cheese, a little mustard and then a few thin slices of ham. A pretty easy recipe. I have another recipe that is more work, but these are nearly as good. A little chewy with soft centers. 3 cups Old Fashioned Rolled Oats. Do not substitute quick oats or any other kind. 1, 4 ounce block of Baker’s brand Premium White Chocolate Bar. You can use morsels, but check the ingredients. If it says palm kernel oil and other stuff it’s fake. It should say “white chocolate!” Palm oil is really bad stuff. You could also add 1/3 cup of dried cherries, raisins or dried cranberries. Add oats to mixture and mix well. The batter will be very stiff and hard to mix with a utensil - just use a clean hand to mush it all together. Scoop about 1/3 cup of the mixture into balls and place on some parchment paper lined baking sheets. You’ll get about 6 per sheet. (You can use a 3 ounce cookie scoop if you have one.) With wet fingers, flatten each ball to about 3/4 inch thick. Bake one tray at a time at 375 degrees. Bake for 10 minutes. The edges should be just slightly golden. Bake an additional minute or 2 if needed. Remove and let the cookies sit on the hot tray for 5 minutes before moving to a cooling rack to cool completely. On a whim I bought a package of this product a few months ago. I've never been very impressed with supermarket pastas like this. I can go to a local Italian market and get quality frozen fresh-made pastas. But this stuff is really good! My market only carries 3 or 4 varieties, but there are many. You'll find them in a refrigerator case. They are not frozen and they keep in the fridge quite a while. They also sell "Family" size packages. I've seen them at Sam's and Cosco. Check out their website. They have lots of recipes for using their product. The pasta has a nice tooth to it and the 4 cheese filling is quite delicious - not bland at all. It makes for a quick meal with simple sauces. I've also bought the sausage filled ravioli and they are good as well. 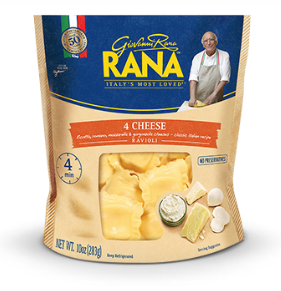 There are about 15 large ravioli in the package. They do get larger after you boil them so a package can feed 2 to 3 people depending on how you prepare them. You can use what you need and keep the rest refrigerated or freeze them. Some times I just do a simple olive oil, butter and garlic with some grated parmesan. Other times I made a simple marinara. The last time I made them I placed them on some non-stick foil on a cookie sheet. I spread a little marinara meat sauce on top then topped that with grated mozzarella cheese. Then I put them under the broiler until the cheese melted. Yummy. I'm toying with the idea of using them to make a lasagna - replacing lasagna noodles and ricotta cheese with layers of these ravioli (parboiled a few minutes, but not completely cooked) and meat sauce and mozzarella. It would probably take at least 2 packages to make a small lasagna. I get it... you don't want to hear another word about turkey right now, but . . . If you want the most moist turkey you ever roasted you should try this method. The secret? No, it's not brining. It's a roasting bag - a Reynold's Oven Bag - turkey size. Ok - the photo gave it away. The white meat comes out so moist and tender. The bird is so tender when done it is falling apart. You can literally pull the leg right off the bird. The turkey cooks in less time as well. 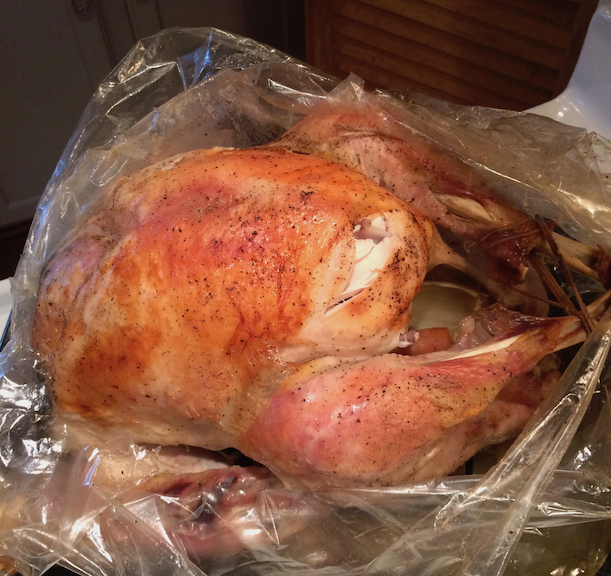 A 14 pound turkey cooks to perfection in about 2 and a quarter hours. (Always use a meat thermometer to be sure it is done as well as prevent overcooking.) Another great plus is the bag preserves all of the juices that come out of the turkey so you have a ton of broth to make delicious gravy. I got 5 cups of broth from a 14 pound turkey! That's makes a lot of gravy. I add some celery, carrots and onions to the bag to flavor the juices. Now, one minor drawback is the skin doesn't get super crispy, BUT you can remove the bag when it is done, pour off the juices and put the bird back in the oven and let the broiler do its thing for a few minutes. The meat is falling off the bone. I cook my turkey the day before Thanksgiving. That way I have time to let the juices separate - the fat from the broth. Just refrigerate it and that will do it. Then just skim off the fat, BUT save it - that's how you make a good gravy. After the turkey cools down I slice it up, put it in a container and refrigerate it. Then I take the carcass, put it in a large covered pot, cover it with water and stew the skin and bones for 3 hours to make even more rich turkey broth which I use for the bread dressing. On Thanksgiving day I pour a little of the broth over the turkey and warm it in the oven in a covered pan. This keeps it moist as it reheats. Cooking the bird the day before leaves the oven free for other things on Thanksgiving day, but most importantly, it allows me time to make a great gravy and get all the broth I can for my dressing. And it makes for a lot less stress on Thanksgiving. 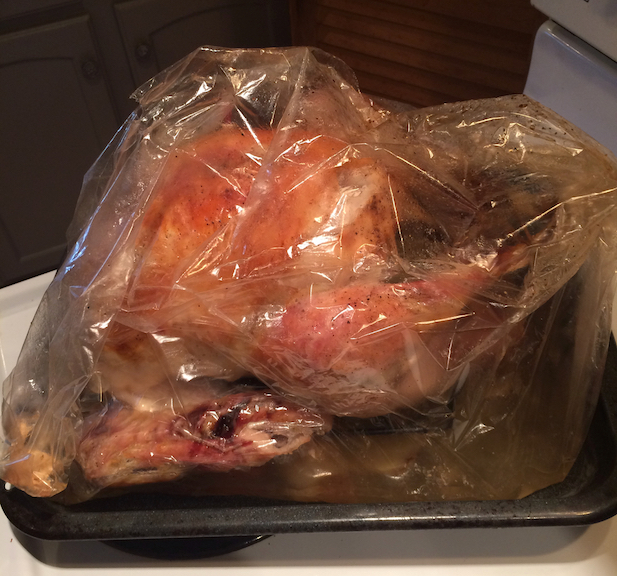 If you aren't concerned about presenting a whole turkey on the table and carving it up in front of guests I recommend cooking it the day before in a REynolds Oven Bag. After you have cooked your fish or chicken or pork, remove it to a plate. Turn the skillet to high. When it is hot add the chicken stock and wine (or vodka, vermouth). Scrape the bottom of the pan to release the fond (the browned bits in the bottom). Boil it down to reduce by half. Stir in the capers and lemon juice. When the liquid has stopped boiling drop in the butter and swirl it around the pan. It will give the sauce some body. Add the parsley and pour over the fish or chicken, etc. NOTE: I hate to open a can of chicken broth and use only some of it. Of course, you can always freeze the rest, but you can also use a bouillon cube. Dissolve a half chicken bouillon cube in 1/3 cup boiling water (if making 1 serving of sauce). 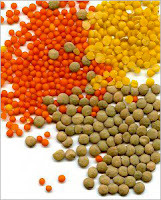 A very trendy side you see on many menus these days are lentils. These tiny beans are a “super-food” like kale. They are good for your colon and digestive health, high in fiber, good for your heart - high folic acid and magnesium for blood flow; they help to regulate blood sugar levels and cholesterol and are high in protein, minerals and antioxidants. Lentils come is several “colors” with the most typical being the green lentils which turn brown when cooked. They are easy to prepare and tasty, too. They pair nicely with fish, salmon, pork or smoked sausage. Put the beans in a wire mesh colander and rinse them well. Pick out any beans that look bad. Place them in a heat-safe bowl and pour in boiled water to cover. Add 2 teaspoons of salt and stir. Cover the bowl and let sit for 15 minutes. In a medium size saucepan sauté the onions, carrots and celery in a little olive oil until just tender. Add tomato paste and garlic and cook about 2 minutes. Add 1-1/2 cups of the broth to the pot along with 1 teaspoon of salt and pepper and the vinegar. Drain the lentils and add them to the pot. Cover and simmer for 20 to 25 minutes - until the lentils are tender. If the liquid evaporates before they are done add the remaining 1/2 cup of broth to the pot. 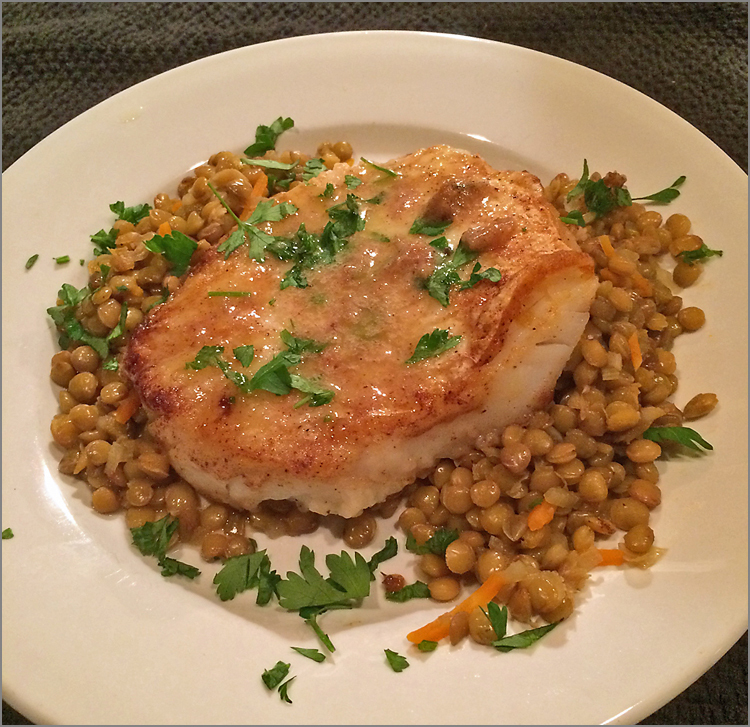 Sauteed cod with green lentils.